There is a difference between conventional combat and guerrilla warfare. While conventional conflict is a designed war between two groups or nations, pertaining to the regular military forces, guerrilla warfare directly involves mass people in general. Our Liberation War is the perfect example of such war where the common people fought against Pakistani occupation forces to liberate their motherland. Though the political situation of that time was a clear indication of the fact that anything might happen any time, even then the common people initially were stunned by the out-of-the-blue attack of the well-equipped Pakistani military on the innocent sleeping Bengali people on the night of March 25, 1971 in the name of ‘Operation Searchlight’. Mass people lost the sense of judging the situation to some extent to decide their course of action owing to severe firing and the glowing flames of fire. Later on, overcoming the trauma they organised themselves to stand against Pak army. People belonging to different social strata joined the Liberation War for different reasons and under different circumstances but all of them had a common aim - to make their country free. While some people picked up arms in their hands to protest all sorts of oppressions inflicted upon Bengalis by Pakistani rulers, some other people joined the war to avenge the misdeeds by Pakistani army during and after the ‘Operation Searchlight’. 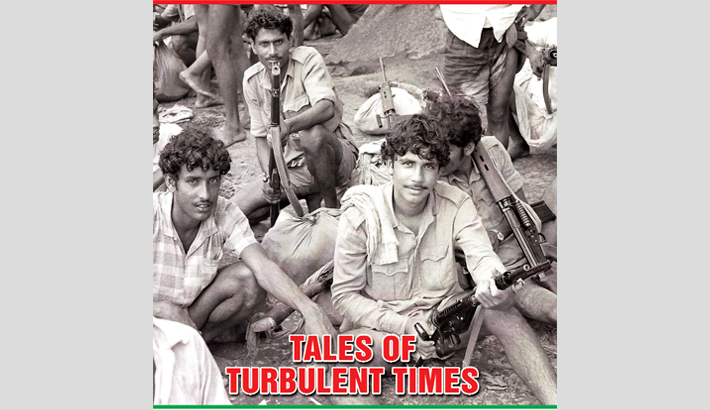 Ahead of the 49th Independence Day of our beloved country, we put together some firsthand accounts of the war narrated by some freedom fighters. Giasuddin was born in Darga Chala village of Sreepur upazila under Gazipur district. He was a 23-year-old young boy during the Liberation War and fought under sector 3. Giasuddin had no connection with politics before the war began, but he was aware of the ongoing situation. Later, he took part in the Liberation War even before receiving any formal training. There was a reason behind his decision. One day he came to know that Pak army had killed 10 people and picked up a newly-married woman from their nearby village. This piece of news infuriated him. After hearing this, he was only thinking about revenge. So after receiving primary knowledge about weapons and how to fire from his brother-in-law, Afaz Uddin, a soldier of East Bengal Regiment (EBR), he along with 50 EBR members and other 150 civilians participated in the first-phase of Golaghat war. They wanted to cut-off the Dhaka-Mymensingh rail line, which was the main route of Pak army. So they demolished the Golaghat Bridge initially, but Pak army repaired the bridge a couple of days later. Freedom fighters tried to stop the repairing works but they failed to do so due to heavy firing by Pak occupation forces. Later Giasuddin went to India for training and after returning from there, he was selected the group commander and eventually took part in many battles during the war. Abdul Jalil Khan, hailing from Bayra village of Singair upazila under Manikganj district, joined Pakistan army in 1969. His posting was at a military air base in Rawalpindi, Pakistan. In January 1971, he came to his village on three-month leave. In March 12, 1971, he reported at Dhaka cantonment located in Banani and was scheduled to fly a few days later for Rawalpindi. On the fateful night of 25 March, he and some other members got sacred when they heard the firing sound. The next day he along with some other soldiers fled away from the tin-shed camp wearing civil dress. Jalil started his journey for Manikganj, but after reaching Tongi he and two others (one of them was a butcher named Abbas) were caught by Pakistan army and were taken to a military camp near the new airport. They did not recognise Abdul Jalil as a soldier. Abbas was asked to slaughter animals while Jalil was doing usual jobs. In that camp 50-60 women, some of whom were the students of Dhaka University, were kept captivated, raped and tortured by the army personnel. If somebody died, they used to throw the dead body in a nearby swamp. All of these activities were just intolerable to Jalil and others. Thus they made their mind to take revenge. Jalil and his companions found out that only three soldiers were kept on guard in that camp. Thus Jalil devised a plan. A few days later, they got the chance and killed the guard with the weapons that Abbas had in his possession to slaughter animals. They freed the women as well. Later Jalil came to know that an arrest warrant has been issued against him as he left the military camp. He went into hiding for some days and later joined freedom fighters’ training under the leadership of Captain Abdul Halim Chowdhury. Abdul Jalil took part in many successful operations during the war. Ashraf Ali Khan was honoured with the title of ‘Bir Protik’ for his contributions during the Liberation War. He took part in different operations that were conducted in Kodalkati of Bochaganj upazila under Rangpur district. He was not pre-determined to join the war and he did not even know about it. Ashraf Ali joined Pakistani army as a soldier a couple of years before the Liberation War. In March 1971, he was outside the Jessore cantonment for winter training and he got to know about the liberation war at that time. After coming back to the cantonment, they realised that they had been kept under surveillance. Bengali officers and soldiers were quite sure that Pakistan army would attack them on March 29, so they were secretly taking preparations to resist the attack. Ashraf Ali along with some others stole some arms breaking the lock of the warehouse. Ultimately, they were attacked. They opened fire as well. Though there were 600 Bengali army members, 500 of them were able to escape while 100 Bengali army men were killed in the cantonment. After the escape, they were divided into different groups. Among them one group consisting of 123 members went to Kaliganj upazila under Jhenaidah district and met Lt Hafiz Uddin Ahmed, Captain Matin (EPR) and others there. Later they were divided into two groups - one group went to Benapol border region and the rest of them were sent to different parts of the country to kill the enemies. Wasikar Md. Iqbal Maju was a young boy during the time of the war. At that time he used to attend different demonstrations secretly. He and some of his friends used to take part in different closed-door conversations. The arrogant attitude of Pakistani dictators made their blood boil. They vowed to teach a befitting lesson to them. Thus after the historic speech of Bangabandhu Sheikh Mujibur Rahman delivered on March 7, they started receiving training with dummy rifles. One day when they were parading Maju was taken aback as his father went there to bless him, which literally inspired him to participate in the Liberation War. In the month of April when Pakistan army entered Gaibandha, they at first searched for Maju and his companions. Sensing the danger Maju and his companions planned to go to India for proper training. They started their journey by boat accompanied by two Hindu families. On their way Salu, a razakar, stopped them and ordered them to leave the Hindu families behind. Maju and his companions opened fired with a view to saving the Hindu families. Later they went to India and after coming back Maju fought against Pakistan army in their locality. Well, the list will go on if we keep narrating those tales of the war. There are many other such inspiring and touchy stories. However we must not forget that we are free today because so many good souls (both men and women) made supreme sacrifices during the Liberation War.